As we made our way from Mangalore into the interiors, to a village called ‘Idhu’, there was a slight doubt in our minds, whether we would find the Kambla event. All attempts to reach the phone number given were futile, the village was nowhere to be found on the map, and there were no posters in town. The doubt lingered till somebody on our bus nodded and confirmed that the Kambla indeed was taking place. 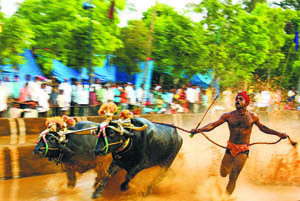 Kambla or Kambala are very popular traditional "buffalo races" held in the districts of Mangalore and Udupi. At present, 45 such races are held every weekend from December to March each year, mainly under the umbrella of the Kambla Samiti. Some are also organised by local patrons. Originally a part of the traditional harvest festival, they became popular as a rural sporting event over the years. The objective of the main race is pretty simple — the fastest pair of buffaloes wins. The pair of bulls is held together with a wooden plank near the neck and the reign is in the hand of the farmer, who sprints with them in water-filled muddy tracts, egging them on to push their limits, and pushing his own in the bargain too. The lifecycle of the race begins with the process of selecting the animals fit enough for the race. Those chosen are trained for years with due attention paid to their diet. As we walked around the premises, we saw teams waiting patiently. Well-sculpted riders, who could pass off as walking advertisements for any urban gym, were resting. The animals chomped away, as their attendants gave them oil massages. The oil, we were told, actually acts as a pain-relief agent and helps keep the animals relaxed between the events. There was a sense of langour hung in the air, which made me wonder whether these large animals would be able to even get up, let alone sprint furiously with their large bodies displacing the water in the tracks. The animals were lead up to the start line where they were examined to ensure they are in the right group. Someone peered closely at their remaining teeth to ascertain their age. The process is all very official in these races. Right from the selection of the right pairs of bulls to the pre-race preparations and the actual event, everything is choreographed like clockwork. The riders began talking to the animals, patted their backs, splashed water on them. Gradually, they turned up the tempo. Voices began to be raised, and out came the whips — the excited animals were heatedly prepared, raring to go. Seeing the raw energy of the bulls at the start line, the crowd edged towards the ropes. The key to success in this race lies in coordination — a precise understanding between the rider and his animals. As the race began, the riders roared and his fervour pushed the bulls to run with all they have. As the race progressed, the crowds fell silent listening to the riders’ cries and the bulls’ hooves. The sprint finished in seconds and the excited animals and their perspiring riders began to cool down, as the winner was announced. Mangalorean snacks and sugarcane and fresh lime stands did brisk business. Celebrities in our own right (made so by our cameras), we retired to a local house at night. During the course of our stay, we had named a buffalo, made him our mascot, cheered him in the race and spent the rest of the time walking through the village and relaxing at a tea shop. In the distance, the crowds cheered. The Kambla would continue through the night. Madhu Reddy is a full time traveller and a part time photographer and writer.